Web design trends change. These days it’s getting normal to hire a professional agency to design great looking views with properly selected colors, gradients, and animations. But the modern UI is not only about creating a bunch of panels with rounded corners. It’s about making the user’s interaction with your application convenient eliminating unnecessary forms, warning messages (like please use only digits and dashes while entering the phone number), pre-populating fields wherever possible, asking for the user’s input only when it’s absolutely necessary, smart processing of scanned documents and more. This is what we mean by modern UI, a.k.a. UX or User Experience. Instead of just re-creating your legacy application to run on the Web or mobile devices, we analyze its workflow trying to identify what can be changed to improve the UX. 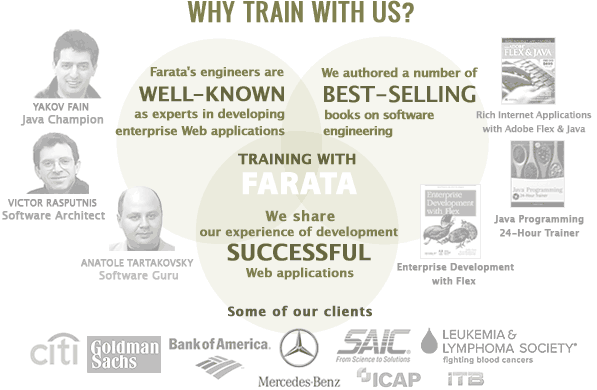 Presentations created by Farata’s Software Engineers. Apps must offer simple, intuitive and responsive UI that let their users get things done with less effort and time.